Mumbai, April 24: For years, the villagers of Burujwadi trekked up a hill to return with pots of water on their heads as the searing heat scalded their feet and the dust filtered their vision. On the foothills of Matheran, around 90 km from Mumbai, these villagers never believed the routine could change. Children ogling swank cars kicking up dust trails, people living in extreme penury, making Rs 20 to Rs 25 a day: You can't escape the similarities with Chandipur in Swades. And true to the script, Burujwadi's residents along with six other adjoining villages outwitted the odds and brought water to their doorsteps with a water harvesting facility they built themselves. "Tankers were alloted to supply daily water to our villages in April and May—they actually turned up only twice or thrice a week,'' says Hari Yurupirkar, another Burujwadi local. 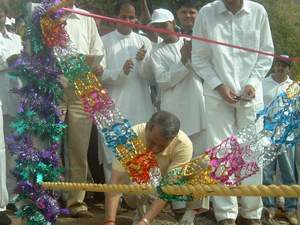 So while Shah Rukh Khan played facilitator in Swades, the Satya Sai Baba Trust in Mumbai replaced him in real life, inaugurating the harvesting apparatus on April 18, with funding from HDFC Bank. Yurupirkar's fellow villagers worked eight long months, even making the bricks in the local kiln. The pay-off has been the sweet taste of running water—the project brings water to 1,200 villagers across seven villages. The project essentially comprises a 17-ft-high bund that holds back rain water, a pump to carry the water to a 90,000-litre tank on a hilltop and 13 distribution points with three taps each. Incidentally, it was the villagers who first approached the Sai Baba Trust in neighbouring Dodani Village, where it runs a primary school. Back at the inauguration, the locals didn't turn up and the corporate guests wondered where they were. Where were they on the big day? Getting dressed for the occassion. 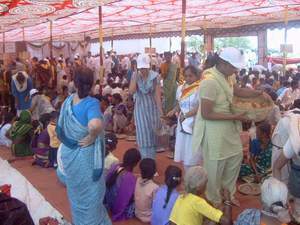 When they emerged, the women had flowers on their heads and the children went straight for the water. Underlining the festivities though, was irony. The Morbi dam, built on land emptied of villagers and under construction for over 10 years now, will actually supply water to the urban sprawl of Navi Mumbai. 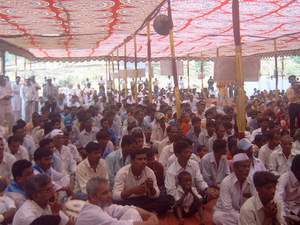 "The government hasn't even paid us for the land it has taken away to construct the dam,'' says Vishu Kewari, sarpanch of Burujwadi. For now, though, Burujwadi has built itself the opportunity to dream. "We can probably start a broom-making business now,'' says Kamal Bhasma, Ambewadi's lady sarpanch of the womenfolk, as she looks appreciatively at the water gushing out of the taps. This Water project involves the supply of water to 5 villages, which could also lead to seven if plans are finalized. The names of the villages are (1). 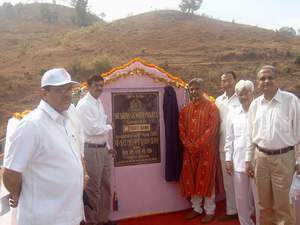 Burujwadi (2) Dandwadi (3) Tepajiwadi (4) Chinchachimalo (5) Nimbarwadi. All these villages are on the Karjat side of Karjat hills and are at a height of 2500 feet from the sea level, roughly about 88 Kms from Mumbai. All the villages are severely in need of water during the summer period of three months and have to trek and carry water from the bottom of the hill to height of 2000 feet daily for their daily water need. Burujwadi: This is the main village at a height of 2000 to 2500 feet above the water source point. The number of houses in this village is about 55 with almost 7 to 8 people in each, which works to a population of 450 approximately. Dandwadi: This village is next to Burujwadi at a distance of 1000 feet. The number of houses in this village is 16 and population works to around 145 odd. 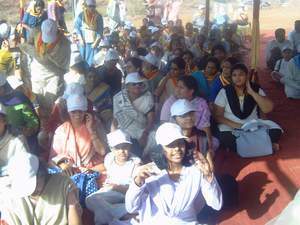 Tepajiwadi: This village is at a distance of 900 feet from Dandwadi. The number of houses in this village is 14 and the approximate population is 120. Nimbarwadi: This village is at a distance of 1100 feet from Tepaji wadi. The number of houses in this village is 40 and a population of 360 odd. Chinchachimalo: This village is at a distance of 1600 feet from Nimbarwadi. The number of houses in this village is 45 and a population of 400 odd. The plan to successfully complete this project meaningfully will be as follows. To enhance the already existing source of water which is a well, either by rain harvesting or integrating it with an additional bore well to ensure sufficient water supply for a the villages. To fit a heavy water pump of almost 3 phase 10 HP so that it can take care of supplying water at a head of 2000 feet and a distance of almost 3800 feet. Here again we will require taking expert opinion before we finalise on the rating and capacity of the pump to suit the terrain. HDPE and GI pipes will be required to connect the source to the top tank and from the tank to the different platforms constructed in the five different villages. A massive RCC reservoir tank of almost 45000-liter capacity to store and facilitate distribution to the respective villages. 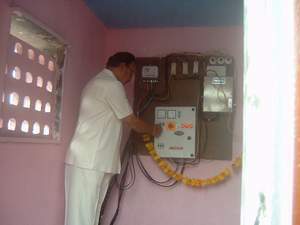 Electrical connection is available till the source but the sanctioning of power and meter boxes with its connecting accessories will have to be taken care of for the water pump. Any necessary permission from the Tahasildars office and Gram panchayat will have to be taken with the help of the villagers and the local Sarpanch and Upasarpanch. There is an already existing water source, which is a well at the bottom of the foothill having a dimension of 23 feet in diameter and almost 30 feet in depth. This source gets dry by the mid summer time and there is need to harvest water in this well to sustain it throughout the summer. 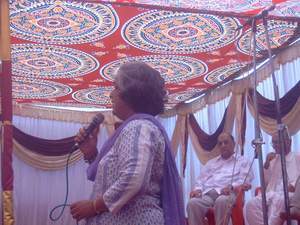 There is also a possibility of going in for a bore near by to integrate with the existing water source and thereby be sure to supply the much-needed water to sustain all the five villages through out the year. Experts such as geologist and rain harvesting experts will have to be taken to the site to get a thorough report and feed back of the plan of action, which will be most practical and economically viable. The total head from the source of water to the proposed water tank reservoir would be approximately 2000 feet and at a distance of 3800 feet. The initial 1200 feet has a steep gradient and thereby has a gradual gradient upto the water tank reservoir. There is an electricity pole very close to the well and all that is required from the MSEB will be the sanction of almost 10 HP of power. The MSEB officials may decide the cable and extension from the pole to the well after we duly apply for the power. MSEB official will have to be taken over there to get an estimate and time required to finish the project. The distance between each village and its terrain is explained below. From Burujwadi to Dandwadi is about 1000 feet. There is a slight dip in the terrain, which again goes up and ends in the village. The proposed site for the water tank is in between Bujurwadi and Dandwadi and is at a height of 300 feet head and a distance of 1000 feet from Burujwadi. From Dandwadi to Tepajiwadis around 900 feet wherein there is a dip and climb between the two. From Tepajiwadi to Nimbarwadi is 1100 feet and from Nimbarwadi to Chinchachimalo is 1600 feet. Here again there is a dip and climb between the two villages. The added advantage in doing a project wherein five villages together is benefited is not just the economics wherein the overall cost and effort is reduced but also the number of people benefited and the message that gets thru to a compete belt. The awareness towards Baba is already on the growth and this project will definitely help in cementing the belief on the gram seva programme to bring more and more people into Swamis fold and prove to them by example Swamis principle and message. 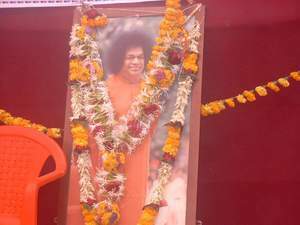 Bhagavan Sri Sathya Sai Baba instructed that this water project must be inaugurated on 18.04.2005 on the auspicious Ramanavami Day. Water is the lifeline for human life. While most people in the urban areas take clean and pure drinking water for granted, there are many villages in the country, where availability of drinking water is a luxury. 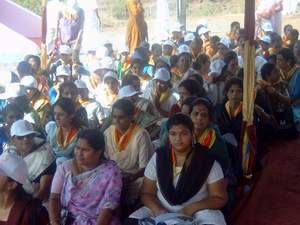 The cluster of villages at the foothills of Matheran is one such place. These villages have abundant rainfall but due to poor conservation techniques they face severe shortage of water post monsoon. The villagers are compelled to trek almost 3-4 kms to fetch water. 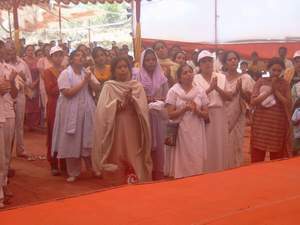 The Sri Sathya Sai Trust Maharashtra, a service oriented spiritual organization, inspired by the monumental humanitarian work of Sri Sathya Sai Baba,'undertakes many public service projects across the state of Maharashtra. 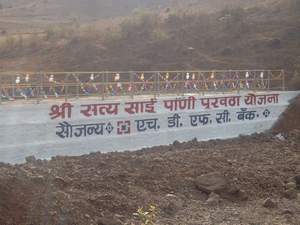 The water project for Adivasi villages located at the foothills of Matheran is one such project, which gives an excellent example of how various organizations can come together and achieve great things for greater good and upliftment of the poor & the needy. This project has been fully funded to the tune of Rs.18 Lakhs by the HDFC Bank Ltd. which is the leading private sector bank in India providing a whole range of banking solutions covering both commercial and investment banking on the wholesale side and transactional / branch banking on the retail side. It is the bank's wholehearted support, which has aided the quick and successful implementation of the project. 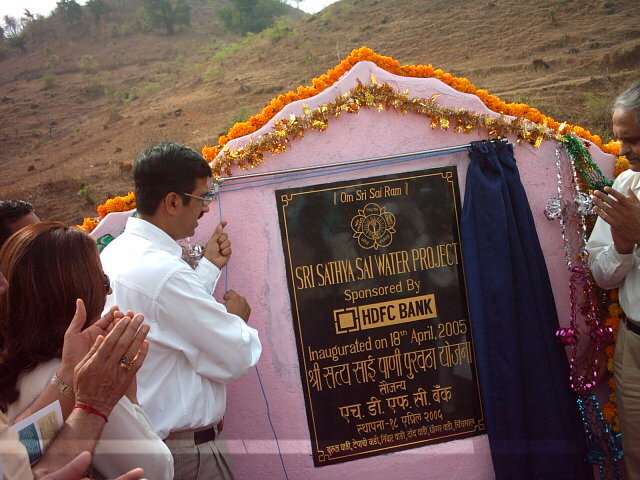 This project is one amongst the myriad social responsibility missions taken on by HDFC Bank to serve humanity. The fundamental teaching of Sri Sathya Sai Baba which is "Love All Serve All, Help Ever Hurt Never" and the HDFC Bank's caption "We Understand Your World" has brought the synergy of Love & understanding resulting in manifestation of this project. This project will cater to 7 villages and will provide water to more than 1200 villagers. A Bund is built which will conserve the water and will supplement the well, which acts as the permanent source of water throughout the year. A submersible water pump of 15HP is installed which will pump the water to the height of 120 meters on the hillock. HDPE pipeline measuring approximately 5 Kms has been laid which will carry the water to the Water Storage tank. The capacity of the storage tank is 90,000 litres which is built on the hillock. There are 14 water distribution outlets built, which will provide cool pure drinking water to the villagers at their doorstep. 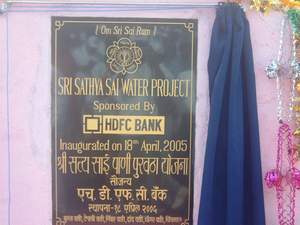 April 19, 2005 - The Free Press Journal, Pg 15, 'Joint efforts of HDFC Bank and Sri Sathya Sai Trust make 7 tribal villages 'free from water scarcity'. 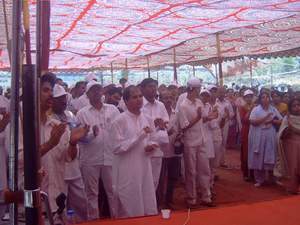 April 21, 2005 - Navbharat Times, 'HDFC Bank - Sathya Sai Trust Water Project Inauguration'. 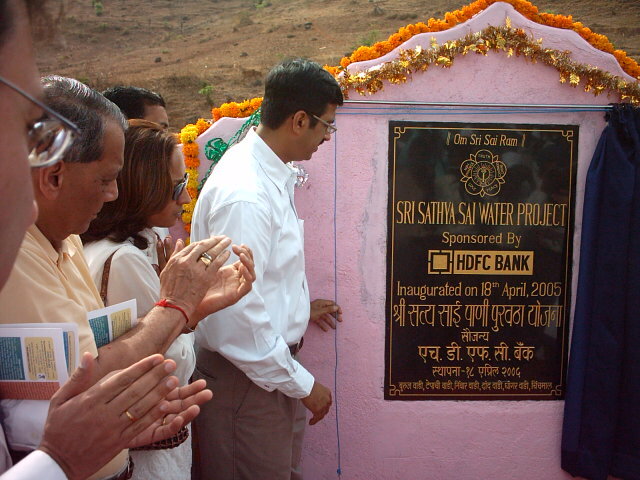 April 21, 2005, Saamna, 'HDFC Bank - Sathya Sai Trust Water Project Inauguration'. April 25, 2005 - Indian Express, 'Water from Dust'. 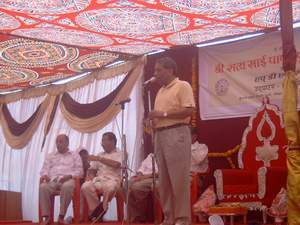 April 26, 2005 - Loksatta, 'HDFC Bank - Sathya Sai Trust Water Project Inauguration'. Water is the lifeline for human life. While most people in the urban areas take clean and pure drinking water for granted, there are many villages in the country, where availability of drinking water is a luxury. The cluster of villages at the foothills of Matheran is one such place. These villages have abundant rainfall but due to poor conservation techniques face severe shortage of water post monsoon and the womenfolk have to trek almost 3-4 km for fetching drinking water daily. 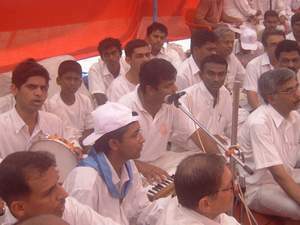 The Sri Sathya Sai Trust Maharashtra is a service oriented spiritual organization, inspired by the monumental humanitarian work of Bhagwan Sri Sathya Sai Baba, undertakes many public service projects across the state of Maharashtra. 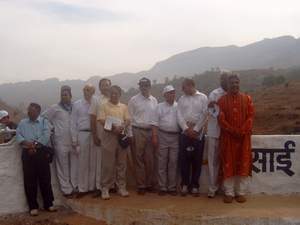 The water project for Adivasi villages located at the foothills of Matheran is one such project, which gives an excellent example of how various organizations can come together and achieve great things for greater good and upliftment of the poor & the needy. This project has been fully funded to the tune of Rs. 18 Lakhs by the HDFC Bank Ltd. which is a leading private sector bank in India providing a whole range of banking solutions covering both commercial and investment banking on the wholesale side and transactional / branch banking on the retail side. 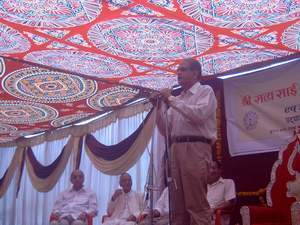 It is the banks wholehearted support, which has aided the quick and successful implementation of the project. This project is one amongst the myriad social responsibility missions taken on by HDFC bank to serve humanity. 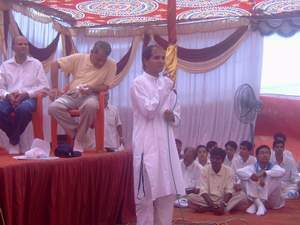 The fundamental teaching of Sri Sathya Sai Baba "Love All Serve All & Help Ever Hurt Never" and the HDFC Bank's caption "We Understand Your World" has brought the synergy for this project to manifest serving the poor Adivasi villagers. This project will cater to 7 villages and will provide water to more than1200 villagers. A Bund is built which will conserve the water and will supplement the well, which acts as the permanent source of water throughout the year. A submersible water pump of 10HP is installed which will pump the water to the height of 120 meters on the hillock. 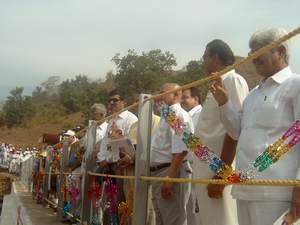 HDPE pipeline measuring approximately 5Kms is laid which will carry the water to the Water Storage tank, which has the capacity to store 90,000 liters, is built on the hillock. There are 14 water distribution outlets built which will provide cool pure water to the villagers at their doorstep. 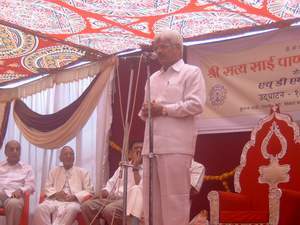 The project is at the final stages of its completion and is scheduled for the inauguration on the auspicious occasion of Ramnavmi which falls on 18th April 2005.